Vaping has earned itself the reputation of being the healthiest and purest way to consume cannabis and other herbs without inhaling all the unhealthy carcinogens. We take a look at a few herbs you can add to the mix to get even more out of the experience. People vape all sorts of plants individually, but not many know that a lot of common herbs can be paired with cannabis to enhance the vaping experience. Herbs like kratom, lavender, and damiana can improve the taste of cannabis, particularly if you have some mid to low grade weed, as well as provide some added benefits. All these herbs have pleasant effects when vaped alone, so naturally, the experience is intensified when mixed with marijuana. According to Dr. Ian Mitchell, an emergency physician and clinical assistant professor at the University of British Columbia in Vancouver, cannabis is typically vaped at 175-200°C. This temperature can be adjusted when cannabis is combined with other herbs. It's best to find a middle ground temperature that's right in between what would optimal for each. Kratom, also known as mitragyna speciosa, is a tropical evergreen tree from Southeastern Asia. Kratom is one of the most popular herbs to be vaped together with cannabis. It's been used for centuries, but only recently became more mainstream in the western world. On its own, kratom produces a mild high for some users. Less than what one would feel after smoking cannabis. But mixing the two could open up a whole new world of spiritual connectivity and psychedelic vibes. Most users who've tried the combination state that kratom helps to enhance the effects of the cannabis rather significantly. The ideal temperature for vaping kratom is 175-200°C, which is right in line with the best temperature for vaping cannabis. These two trippy, holistic herbs are a match made in vaping heaven. Those who vape are often partial to lavender and mint. While the flavours are vastly different, the effects are fairly similar. Lavender is a scented, flowering species of Lamiaceae plants, more commonly known as the mint family. Both lavender and mint are very comforting herbs to vape that can help you relax physically and mentally. Both can soothe the smoke as well if coughing happens to be an issue when smoking bowls. About 75% cannabis and 25% supplemental herbs would be a good mixture to start with, that way the taste of mint or lavender won't be too overbearing. Another popular combination is 50% cannabis (good indica preferred), 25% lavender, and 25% percent sleepy time tea. It's smooth, and it tastes phenomenal. Use this combination before bed to sleep peacefully throughout the night. Mint is best vaped at 160-175°C. When vaped alone, lavender is usually vaped at lower temperatures, somewhere around 130°C. But a lot of people vape it together with cannabis at higher temperatures and don't have any issues. St. John's Wort is part of the Hypericaceae family that was originally native to parts of Asia and Europe. Presently, it has spread throughout the world and grows in many different regions in the wild. It works as a very mild monoamine oxidase inhibitor (MAOI). So mild in fact and with so few side effects, it's often prescribed as a mood stabiliser for children. MAOIs have been known to reduce the necessary dosage levels for other drugs to work in your system, so it wouldn't be a far stretch to assume that it might do the same for cannabis. Both cannabis and St John's Wort are very effective antidepressant and anti-anxiety remedies. When paired, patients feel almost immediate relief that lasts for hours. St John's Wort is known to exacerbate the symptoms of ADD and ADHD, but cannabis is proven to help improve symptoms of those disorders. St. John's Wort is supposed to be vaped at low temperatures, around 100-150°C. It's best to vape cannabis first at 175-200°C, followed by St. John's Wort. If you prefer vaping them simultaneously, 160-175°C might be a happy medium. A subtle blend of marihuanilla, passionflower, and cannabis is another mix that's recently become popular. It has a smooth and sweet flavour but it doesn't overwhelm the taste of the cannabis, and the high differs from using weed alone. The high is described as higher energy and more lucid. It makes sense considering that passionflower is often used with other psychedelics to strengthen and prolong their effects. Some people choose to exclude the passionflower and use just the marihuanilla and cannabis mixture as a tobacco replacement. The preferred temperature to vape passionflower is 150-160°C, and for marihuanilla it's 150-175°C. Kanna is a succulent with small, white flowers that originated in Africa. There aren't many noted medical benefits to kanna consumption aside from anxiety relief, but the psychedelic effects are well documented. Combining it with cannabis will make everything more surreal and upbeat than usual, but using too much could lead to some vivid hallucination and nausea. The mixture of cannabis and kanna should be vaped at 185-190°C to feel the full effects. Damiana is a shrub with pretty yellow flowers that's native to South Texas, Mexico, and South America. It's mainly used as a stimulant, but it's also known to be a powerful aphrodisiac, which could be a good or bad thing depending on the situation. Another legal plant with effects similar to those of cannabis, damiana is often used as a substitute or alongside the lovely green flowers. The flavour mixes nicely with marijuana, and it enhances the relaxing and euphoric feelings felt when getting stoned. Note that the flavour can linger for a while. Some people love the taste of cannabis alone, so to avoid that you can either vape the cannabis first, or use separate devices for each herb. 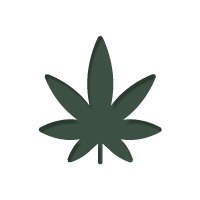 The optimal temperature for damiana, either alone or coupled with cannabis, is 175-200°C. Chamomile has been popular for centuries because it has a multitude of uses. Before modern day medicine, chamomile was used as a treatment for anxiety, depression, stress, headaches, and indigestion. To this day, it's still used commonly for relaxation and as a sleep aid. Chamomile is usually brewed into a tea, but vaping has become a common go-to method for chamomile consumption as well. Chamomile is also mixed with cannabis quite often to either vape or smoke. There isn't a lot of effect on the high, but it's a very popular flavour additive. Vape your cannabis-chamomile concoction at 190°C for the best results. When vaping any new herbs, there are a few important things to keep in mind. First and foremost, always purchase 100% organic products. Any synthetic ingredients could negatively impact the effects it would have. Secondly, don't use too much too fast. It's best to start by incorporating small amounts of herbs into your cannabis to see how your body reacts. Now get to experimenting! Maybe one of these mixtures will provide you with the relief and the high you've been looking for.